August Sock Review: Phoenix Fiber Works- Totally Tweed! Who is in the mood for pie? This month's sock yarn is presented to you from Phoenix Fiber Co hailing from Youngstown of Ohio. Their yarn "Tweedy Pie" is a freckled fiber and a tasty tweed! It is more than just dessert, even though these colors are good enough to eat! "Tweedy Pie" is a 2-ply Sock Weight made of 85% SW Merino and 15% NEP, a dye resistant nylon fiber that adds a tweed fleck to this yarn. Dyer, April Wolf, is naturally gifted when it comes to choosing colors. Her eye is finely tuned to produce colors and fibers that are so delicious we really do want to bake them into a pie and eat them. Weighing in at 100g and 438 yards per skein you will have more than dessert to look forward to. Our sock designer Fatimah Hinds created these amazing “August Tweed” socks using Retrospect colorway. This pattern displays a great use of cables, lace and twists that really show off the quality of this tweed yard. We have come to the end of the Olympics and Ravellenics. Congratulations to all our winners in Rio making us all proud to claim them for our countries. Congratulations as well to all our Rad Rav players. I had alot of fun! I am sure you all did too. There were alot of people who earned their laurels, but thank you to our Mods and a handy random number generator we have selected the recipients for the generous donated prizes. And now for the Team Yarnbox Award Ceremony! Our Participation Prize This prize was chosen from unfinished projects that were mentioned in the Ravellenics thread but weren’t finished. retoldyarns - either a skein of hand-dyed yarn or fiber, whichever the winner prefers! I had so much with my first Ravellenics! I am still going through all the hashtags, so many inspiring projects and work from others. I really really love and appreciate the YB community!! You ladies are amazing! Congratulations to everyone who participated, finished, and those who won. Thank you for the win for my Clarice project; thank you for donation TeamYarnbox! WOW! First time I have intentionally strayed from a project, but so glad I did because I ended up with an amazing top (which is the real prize for me!!). Totally inspired to make up larger projects than scarves now! !!! Looking forward to shipping out yarn for the gals who won my prizes and getting a pattern for IrishEyes. It is so lovely when you have something so simple on your needles that you don't even have to think about what you are doing. Today for Free Pattern Friday I have chosen 2 super easy peasy cowls that could be done in a multitude of weights of yarn. It is super easy and fun to do! This knit piece is a super popular one. The Gaptastic Cowl by Jen Geigley is an instant favorite because of how ding dang simple it is to make! Great for beginners and seasoned professionals alike! Free Pattern Friday: Not socks! Good Morning Boxers! It is Free Pattern Friday and I have some pretty stuff to share with you today. I love sock yarn! However, I am not always in the mood to knit socks. I suffer from a debilitating disease called One Sock Syndrome. I know it is quite common amongst knitters to make only one sock, but when your sock drawer is full of onesies and you never have a matching pair, the OCD in my brain twitches. So how about other things that you can make with sock yarn? Check these out! This first crochet piece, The Raunas Diesdas Shawl by Sigrun Raith is a good one to use with Yarn Enablers Gradient that came out in March Sock Box. This next crochet piece is not a typical item that you'd make with sock yarn, but it so pretty. I am am making a few of these Jar Covers by Olof Lilja Enorsdottir for my thanksgiving table! I think they would be so festive nested in autumnal leaves and acorns. I am using, funny enough, the dark green sparkly Holiday Yarns, Silver Sock that came out in the February Sock box. This pattern, The Cameo Flower Shawl by Mia Rinde caught my eye with it's delicate lace edging but it simple construction makes it doable for all levels of adventurous knitters. We recommend using the Gluttony Sock by Forbidden Woolery. The tonal hues in this yarn would make the lace really sing! The last pattern I have for you today is are super cute ankle cuffs; Zaza by Rachel Henry are so adorable, especially with those shoes! The leaf edging and lace in the main cuff would be beautiful in the Mode Sock by ModeKnit Yarns. I know just the person to wear these. I'm thinking holiday gifts already. Now where are my needles? Summer is the season that strangely makes me want to knit more. Even though it is hot and I don't want to touch wool, linen is a staple in my summer knitting diet! This month's yarn Louet's Euroflax Sport. “Euroflax Sport” is 270 yards of 100% linen and with two skeins of this durable and breathable yarn you get 540 yards to make two amazing pieces by one amazing designer, Tian Connaughton! The colors for this collection remind me of the sea side. Blues of the ocean, reds of boats in their slips, and the lavender of the sun sets at dusk. Both of our pieces this month are designed by the talented Tian Connaughton. She has designed two amazing shawls that are perfect for keeping the chill off your shoulders on cool summer evenings or when your are on your boat and you need to keep your hair from being mussed up. The crochet piece is "Leymus Shawl" with open work and little shell stitches this is a perfect use for a light-weight linen. The great thing about linen is the more you wear it the softer it gets. It may feel a bit stiff in the beginning but it really does soften up and has a great drape that you don't get from wool or even cotton. Tian's knit piece is "Wyethia Shawl". I love the lace edging and for the adventurous knitter I can see the addition of beads on the edge that would make this sparkle just a little. The eyelets at the top are a beautiful detail that makes this feel very elegant and wearable. The swatch this month is crochet and as I was creating it I fell in love with this yarn even more than I already did! I know you will love it too! SPOILERS: Loom Knitting in YarnBox Classic August 2016?! Hello Yarn Boxers! We are excited to announce that we will now be featuring a loom knitting pattern every other month in our box. Below is a link to the pattern and SPOILER info about this months classic box. Please do not click if you do not want spoilers. Hello, my name is Amanda Pratt. Some of you may know me as “Hypnotic Hysteria” from my YouTube channel I am designing Loom knitting patterns for Yarnbox Classic every other month. This August box features my second design using wool from Rauma Garn, Mitu. I learned how to loom knit in 2006 while pregnant with my oldest daughter and for years I just did very simple hats, scarves, and slippers I just had a couple books to learn from and I found reading patterns intimidating and confusing so I was scared to try new patterns but in 2011 I started my original YouTube channel while pregnant with my youngest daughter. It was just to help teach a friend how to make hats too and I never expected anyone to sit through my horrible quality webcam videos but people started to subscribe and then I started getting questions and request. So I began learning as much as I could and kept making videos. No worries, I have a much nicer camcorder now. Currently, I have over 400 videos and do my best to add more weekly. Most of my videos are loom knitting techniques, advice, full beginning to end patterns, as well as product reviews. Because of my YouTube Channel I have been able to do work for some larger chain craft stores on the Serenity Loom where I helped update the directions from the original version to the easier to follow instructions and my YouTube channel was actually mentioned in the packaging. Yes,I felt like a rock star. 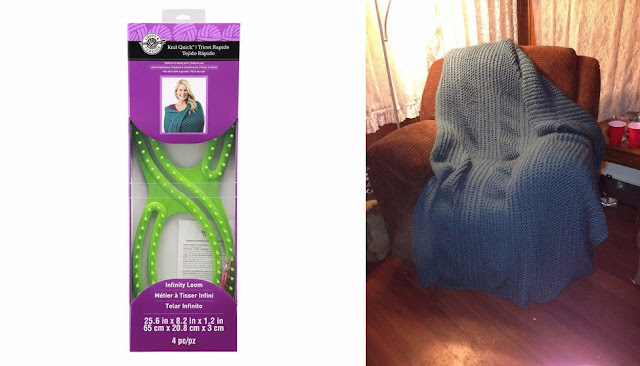 I did some work with the Infinity Loom as well, where I wrote the pattern for and made the actual blanket that is featured on the package. I have also done work for KnitUK, The Gallery London, and CinDWood Looms, with various collaborations along the way. 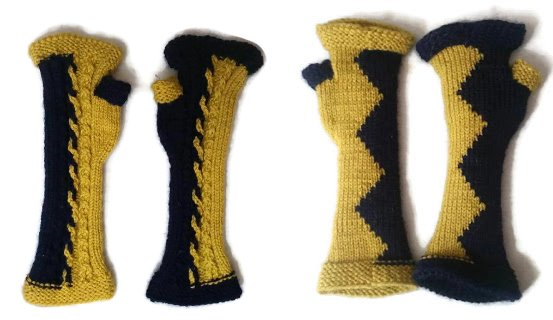 I joined a local knitting guild in 2014. (Shout out to all the wonderful women in the K.O.M. Rivers Knitting Guild!) Here I started to see my fellow guild members getting monthly deliveries of yarn from various companies. So, at the end of 2015 I started contacting every company I came across and NONE offered loom patterns. Most were not even interested in loom knitting. I do know some basic crochet and needle knitting and I love both. However, loom knitting is my passion and I was starting to get discouraged until I contacted YarnBox. They have wonderful communication and an open mind. Everyone I have dealt with during this process have been so nice and I am very happy to be able to be working with them and get to show people Loom knitting is knitting. I just use a loom instead of needles. I feel that YarnBox is in this for the same reasons I do. We both love what we do and are here to support multiple yarny crafts and crafters! Currently, there isn't a set of standards for loom knitting like there is for needle knitting, crochet, or machine knitting. This means that us modern loom knitters are doing our best to bring this craft to everyone by converting needle knitting techniques and patterns. By creating videos and teaching these techniques, we are the ones setting these standards. Terminology may vary from one person to the next but I do my best to be consistent, making sure my patterns have a free video that goes along with them including supportive images, charts, diagrams, and size adjustments for the pattern if needed. For the August YarnBox Classic shipment they sent me 4 skeins (2 in a blue 2 in a yellow/gold) of a wonderful yarn that is 50% alpaca (alpakka) and 50% Wool (ull). The packaging is not in English so I measured and each skein is roughly 125 yards (114.3 meters) with a WPI (Wraps Per Inch) of 11 making this lovely 4 ply yarn a (light) worsted . For the “Harley Quinn” inspired gloves I wanted them to be a teaching pattern where you will learn fun techniques that I hope others will enjoy and use. You will learn the garter stitch, basic 2 stitch cable,how to do a 2 color 2 stitch cable, seamless color changing, basic shaping, and more. The loom I used to make this pattern is the 3/8″ 90 peg Universal Small Gauge Hat/Scarf Loom from CinDWood crafts with 2 wedges. The final pattern is located on the CinDWood website. Follow the link below to the pattern. Thank you for subscribing to Yarnbox we look forward to bringing you more loom patterns like this one in the future! Click here for the pattern on our website. I had a lot of fun working on this project and hope you will too! "The Qunice Sparrow Shawl" by Gauge Knits on Ravelry. Free Pattern Friday: Shrugs and hugs! It's Free Pattern Friday and I want to give each of you a hug! A wooly hug in the form of free shrug patterns! The crochet piece I picked for you today, The Granny Coccoon Shrug by Maria Valles is a wonderfully modern take on the granny square. You can use any weight yarn, just make this square as big as you want. The pattern does call for worsted weight. We recommend using Manos Del Uruagy Clasica, Andy Merino, Peruvian Dream Worsted Which are all available in our overstock store. If you can't find them there, it's because we sold them all to beautiful people like you. The Midsummer Nights Shrug by Melini Melini. Christmas in July Ravelry Swap! Third Annual Yarnbox Christmas in July Swap! Over in our Ravelry group we are just wrapping up on the moderator run Christmas in July Swap. This is a way for our members to break up those boring summer months by sending and receiving a lovely curated present in the mail. This is third year hosting this event and had 58 members join in who created some really great boxes. The fun begins in May where the moderators have everyone fill out a sign up questionnaire which you then post in our Ravelry group with all your answers, and then the moderators match everyone up using all of the information that is provided. Once we have you paired up you are notified of who you will be creating your box for. You don’t get to know who your box is from until it arrives at your door! You then being what we all gently refer to as “stalking”, we use the questionnaire that you posted, if you mentioned any other social medias we may scope them out for hints, and any other details you may have added to your post or other posts during the month before shipping so that a great box can be created! Then on July 1st the fun really takes off as boxes are packaged up and shipped out to their partners! Since we all fill out the same questionnaire and stick to the same budget it is so fun to see how everyone takes this information and interrupts it into a wonderful package for their partner. The moderators have a great time hosting this event and it is always so fun to see everyone get together and have fun giving to others. We see a great amount a chat happening in the Christmas in July thread where we tease hints of what is happening behind the scenes with our partner’s box. Because of course they have no clue that you are talking about them! Yarnbox is going to Stitches! We will have a special treat for existing subscribers. Stop by and say HI!! Bring a friend and get them hooked on Yarnbox, too!